A special screening of an exciting film about an important painter! 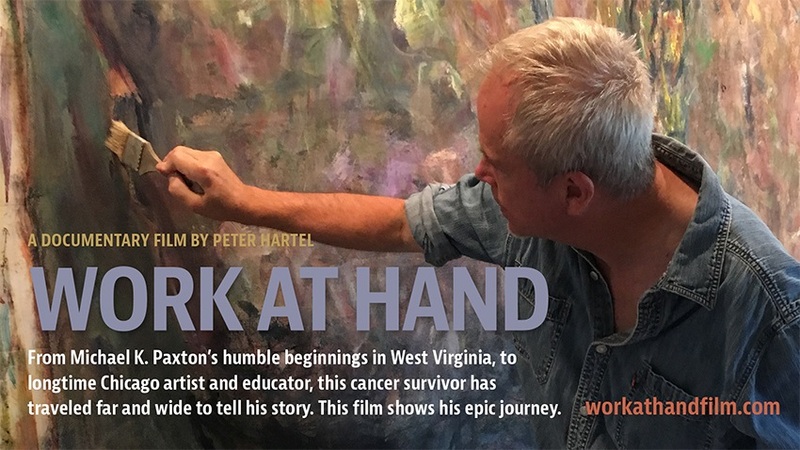 Our film “Work At Hand, Michael K. Paxton” is a 54 minute documentary about the painter Michael K. Paxton, chronicling his life and work. From his humble beginnings in the hills of West Virginia, we follow Michael’s growth and evolution from undergraduate art school at Marshall in the gritty industrial town of Huntington to graduate school at University of Georgia, Athens. During the heady heyday of the emerging scene of punk music, theater and performance art with bands like R.E.M., The B-52’s, and Pylon, Michael dove into this mosh pit of experimentation and free expression, participating in all of these mediums while still working in factories, on the railroad, and as a printer at a newspaper to pay his own way through school. His working class and Appalachian roots informed his work then, and continue to contribute to his paintings today. While his battle to overcome stage 4 cancer, and his continued survival 20 years later are not direct subjects of his work, it is an integral part of his story and a testimony to the sense of urgency and empathy in his paintings. The film takes us to West Virginia see this special place to speak with family, and we visit the people in the art world who most appreciate his work and illuminate what makes Michael and his paintings so special. Along the way we look at his paintings in-depth, and chronical how his work has evolved, and how contemporary events and context have shaped his vision as a man and as an artist. Music by Grand Rapids natives Roger MacNaughton, John W. Hartel, and Chris Avison!